He ain’t heavy. He’s my scleral. Let’s face it, scleral lenses are like an overcoat: big, bulky, and ill-fitting. What happens when you take such a large piece of plastic, fill it with a milliliter of saline, and stick it on the eye? Under the forces of gravity and the upper eyelid it does the only thing it can do: it drops like the heavyweight it is. Then the optics are no longer centered on the pupil of the eye. In school, we were taught the importance of making sure that the optical centers of whatever it was we were prescribing were centered on the patient’s pupil. It is fundamental to good optics that this be done. It’s no less important for scleral lenses – and perhaps even more so. This is because a relatively thick liquid lens is produced by the fluid trapped between the lens and corneal surfaces. If the lens drops, then this fluid lens will be thicker towards the bottom and thinner towards the top. 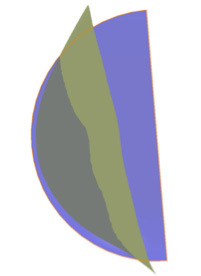 This relationship leads to an increase in higher order aberrations – especially coma, which in turn degrades the vision. Because we at Laserfit deal with minute aberrations, the importance of being centered cannot be over-stated. But how is this accomplished? We do this in several ways. The first is by keeping the lens as thin and streamlined as possible to cut down on unnecessary mass and bulk. Then we can measure the decentration in one of two ways. 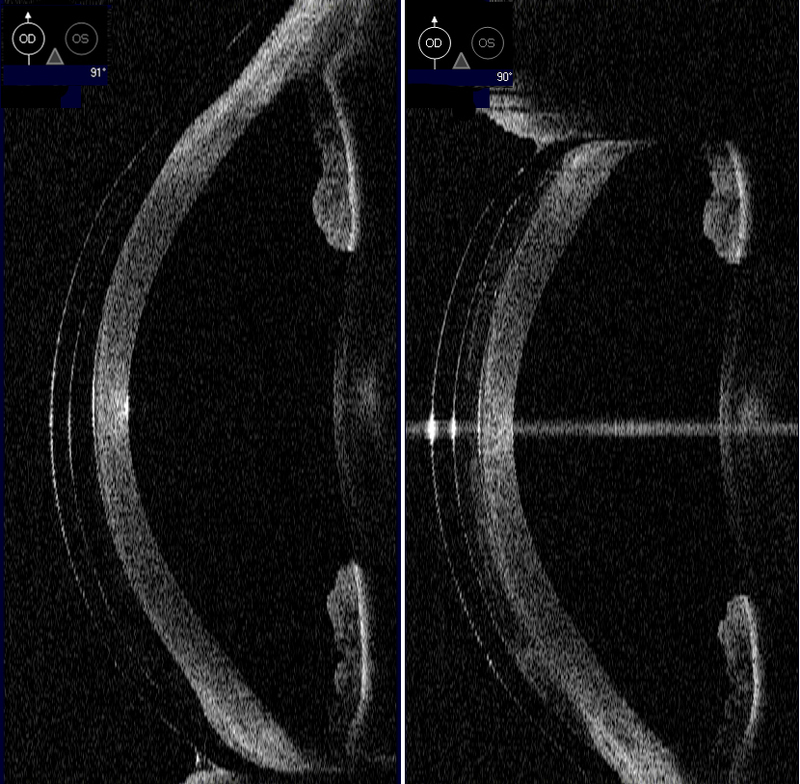 With the aberrometer it is possible to identify the apex of the lens relative to the pupil center. From there we can get the x/y coordinates. 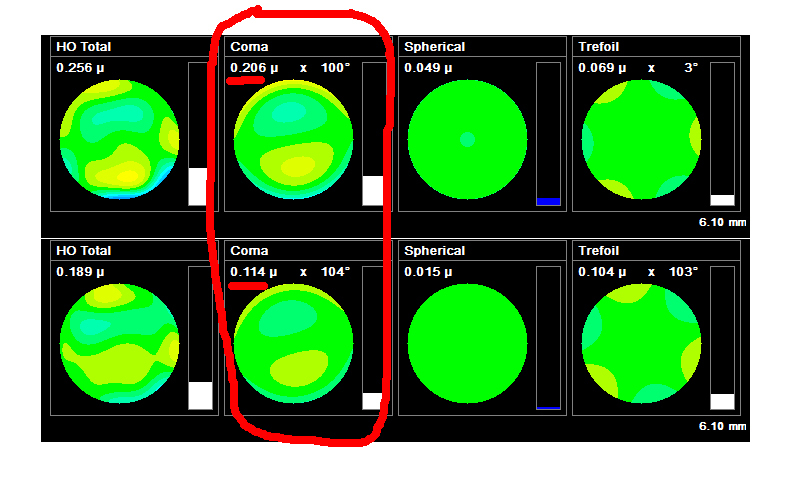 With an OCT image of the lens on the eye we can measure the decentration with special software. With either method it’s simply a matter of programming the new position of the optics into our sophisticated lens design software. 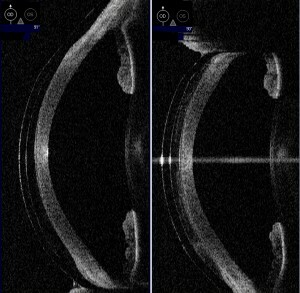 Images of the lens on the eye before (left) and after (right) centration are shown below. The result is a 46% reduction in COMA on average for both eyes and 20/10 vision (before centration TOP and after BOTTOM).